I was going to write one of those dull I didn’t mean to disappear but I was distracted and I lacked the inspiration to write type of posts. Before I got around to it though, inspiration struck! 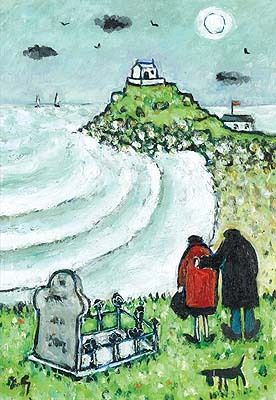 This afternoon we wandered up to the Penlee Museum to see an exhibition. Different Ways of Seeing brings together works by Bryan Pearce, Joan Gillchrest and Fred Yates. Three very different artists, contemporaries, who all painted my part of the world. 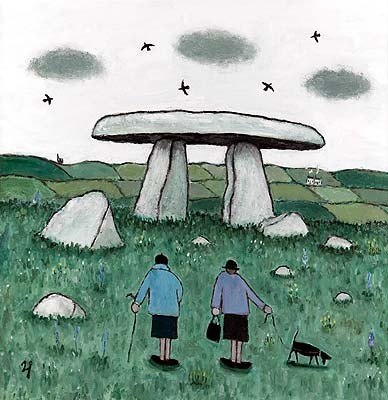 All three interesting artists – and an exhibition well worth visiting if you should find yourself in West Cornwall before 12th November – but it was Joan Gillchrest’s work that I fell in love with quite completely. The Mount seen from Mousehole again, from the window of the restaurant where my aunt used to work. Briar and I walk past this very bowling club when we are heading to Newlyn green to play ball. A few liberties have been taken with the setting, but this is unmistakably my bandstand. I used to walk past it on my way to junior school, and I still walk past nearly every day, with Briar or on my way to town. I hadn’t heard of the artist before this exhibition Cath, but now I am smitten. There is a very good illustrated biography that I scanned in the museum shop, so it might be worth checking your library catalogue. I was confusing The Lobster Pot with the restaurant in The Narrows I think – my aunt worked there too. 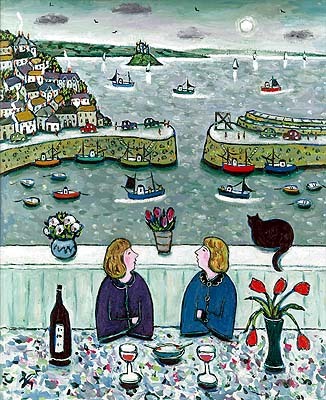 I really should have recognised Mousehole harbour. Good stuff! 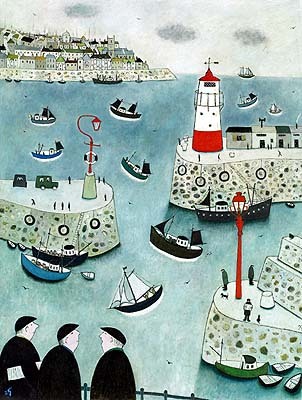 I discovered an English artist I like too: Gary Bunt. He does lots of dogs and old men walking on beaches with funny poems to go with each. Different style but similar quirky sense of humour about things. Now dogs and beaches I love, so I am off to do some research. Thank you! Lovely stuff! 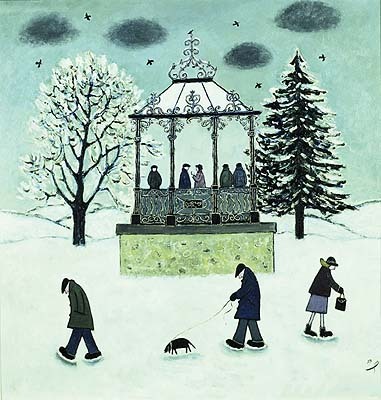 The Bandstand one reminds me of Lowry a bit. I went into my son’s room the other day and saw that he had filched one of the Lowry prints my godmother gave me for our engagement and put it on his bedroom wall. It looks great and reminded me how much I love his work. So glad you had a lovely day. Finding new work that you love is having a great drink isn’t it? You feel so refreshed and full of life and love again. Did I say love enough in that last post do you think? Just checked out her website and I thought the Blessing the Fish and Fish on Fridays were fun too. I love those pictures. 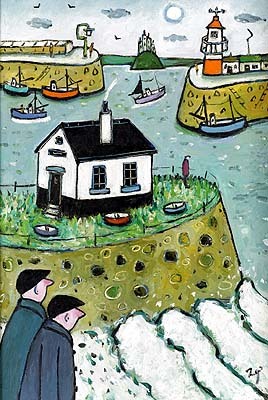 They remind me a little of Alfred Wallis… I love Cornish artists – I am sure the light is much better there and so much more inspiring. 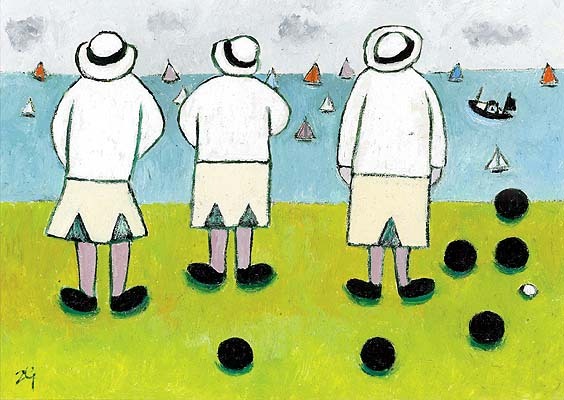 These paintings also remind me of Lowry’s – not quite as matchstick like though! I thought I would name a favourite but it’s hopeless. I hope I don’t offend anyone but these would make a super calendar, you can’t help but smile when you look at them! These are so colorful and cheerful! Thanks. I remember reading her Guardian obituary but didn’t know her work. I love them and they must be extra special to you as the places are so familiar. These are really lovely and special, Jane, thanks for sharing.